Abstract: Jose Leon, Delphi for PHP developer, wrote this article on his blog - finishing the component by adding the missing properties and methods, and creating the Zend_Cache component using all properties of the wrapper. On the previous article, we saw how to create a wrapper based on a Zend Framework component, so this component can be installed inside Delphi for PHP 2.0 and used visually. We also saw how to add properties and subproperties to that component. On this article, we will finish the component by adding the missing properties and methods, and creating the Zend_Cache component using all properties of the wrapper. If we create a new application, drop a ZCache component in a page and execute it, we will get an error telling us "Cannot serialize a component without an owner", that’s because, the subproperties we have created, inherit from Persistent, but the VCL for PHP streaming system needs to get an owner object, so it’s able to generate a full qualified path when storing the property in the session. For that, let’s create a base class for all ZCache subproperties, which will return a valid owner, in this case, the ZCache component. So this is it, if we run a simple page with a ZCache component, it won’t show any error. 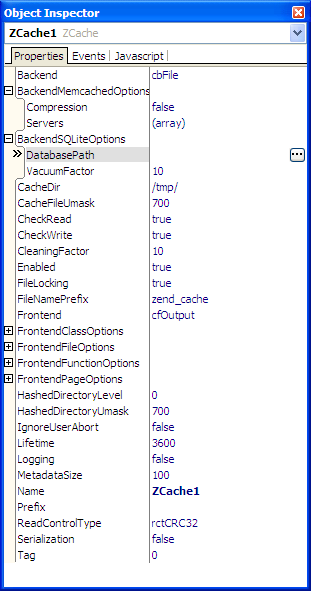 Now we have all the information, we need to create the Zend_Cache component, with all the options, depending the Frontend and Backend selected by the user. It is public, so, in an specific case, the user will be able to use it directly without the wrapper. Now we have to decide "when" create the Zend_Cache component, and the right moment to do it is in the component initialization, by overriding the preinit() method, which is called by the library when the component has read all its properties and is ready to be used, but before most controls fire their events. Notice the clean() method has been divided in four, so there is no need to use the Zend_Cache constants. 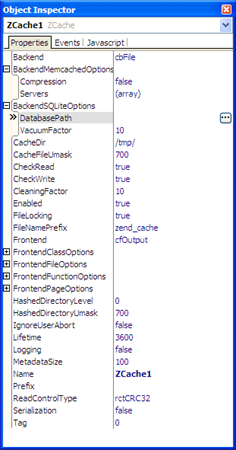 This is a sample from Zend Framework we can use in the same way, but, of course, you don’t have to write so much code and there is no need to remember how to create or initializate the cache, as it is a visual component where all properties are listed, and even valid values for them, are available to be selected from a drop down. If you click several times, you will see the first number it doesn’t change, that means that the output has been cached, so it’s dumped out directly from the cache instead to be executed, not like the second number that is executed every time. Well, in this second article, we have finished the component and it’s ready to be used, we have not documented how to use the subproperties when creating the Zend_Cache component, because that will make a very long article. In any case, in the next article, we will see how to integrate it within VCL for PHP, so it’s easy for user to select which components or pages are cached.